I mean that was a given, since we know Bonkle's not coming back for 2017, so I assume any prototypes were locked up in LEGO's vault where themes go to die. Guess what? I was looking for some images and I found some backgrounds from my lego network. It gives us a clear view of the unknown ice guy from strakks box! 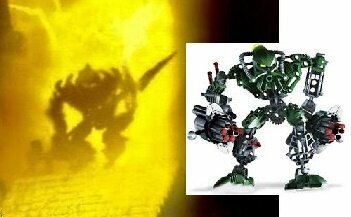 looks like a metus, fused with Matoro with Nuparu Claws. Knowing the trend with concept art I can reasonably say that is just an indev version of Metus. I've made and seen enough concept art to get the deal with these things. That to me looks very much like an altered Matoro Mahri. Wait..... is that a prototype Baterra? I was looking for some images and I found some backgrounds from my lego network. Great Scott! Are there any images of the unknown staff-wielder from Malum's box? They're even in the same pose! I checked it, your right. Hold up, I don't recall ever seeing the baterra in any visual medium, what is that from? y'know i said the same thing, right? I don't know for sure, but I think it's from a graphic novel. I just found the image on Google. 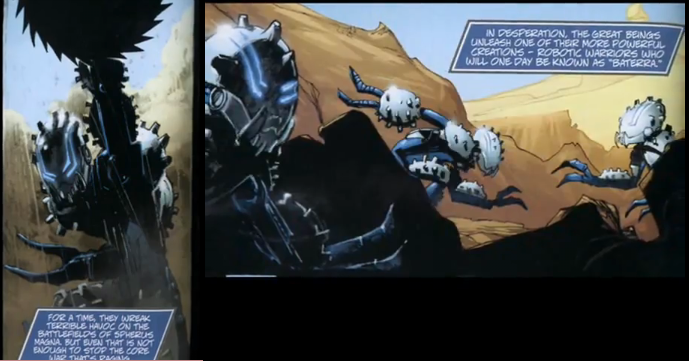 The Baterra were featured in Fall and Rise of the Skrall, a story from the 8th Graphic Novel. Oooh... someone's gotta MOC that. Maybe I should. You can also read it in it's entirety on BioMediaProject nowadays, or buy it on Amazon. Definitely recommend it, there are some backstories for Bara Magna in there. That looks like it was for 2015 style 2016 animations. Hey, was there ever anything planned for bionicle 2017, or was it always going to be 2 years?